They have labeled me a terrorist. This is the same Dean Garrison whose Father was a well know pacifist? They say the apple does not fall far from the tree and they may be right. There are very few things in this world that would make me want to go to war and kill another human being, but we all have our limits. I am a conservative Christian who happens to believe in my Rights protected by the Constitution. These rights are only protected by this Constitution but granted by God. I am sorry if bringing up God makes some uncomfortable but this country was founded on His principles of equality, freedom and the rights of the individual. I do not bow to your king. I bow to no one because I am an American. Americans are fighters. We come by that trait honestly. We had to fight for our very freedom from a tyrannical government. Many of us have had to fight for our freedoms from this government. Let us not forget the Native Americans, African-Americans, and for that matter, the women who have had to scratch and claw and fight for their own liberties. This government has never been perfect, but when injustice is present it is our duty to be prepared to fight to solve those inequities. This is who we are. We live by the "dangerous liberty" that Jefferson spoke of and not the "peaceful slavery." So am I a domestic terrorist? If the love of country makes me a domestic terrorist then I will proudly accept the title you have given me. I speak the truth today because it needs to be said. I will not cower in fear because that is what you want. You cannot continue to intimidate America. We are calling you out and it's time to talk about this. Most of us are wise enough to know that the Department of Homeland Security was formed to protect us from terrorism. We simply did not understand what the definition of "terrorism" would become. We all assumed the real reason for the creation of the DHS was to fight against the uprisings of Al Qaeda or Mexican Drug Cartels, for example. Now we give Mexican Drug Lords weapons and put members of the Muslim Brotherhood into top government positions. It is clear who the real target is and it is not foreign-born terrorists. It is God-fearing, constitution-loving, conservative people who want nothing more than a country that embraces the values of a great Constitution, rather than an administration that seeks to destroy it. For the Patriots of this country, the Constitution is second only to the Bible for most. For those who love this country, but do not share my personal beliefs, it is their Bible. To them nothing comes before the Constitution of these United States of America. For this we are all labeled potential terrorists. The DHS is arming at an alarming rate and "We the People" are not stupid. So you want to take our freedom? You want to take our guns? You want to lock us up and throw away the key? 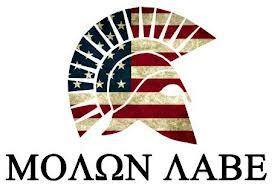 I've got a message for you… Molon Labe…Come and Get Them! I want to remind you that history is not on your side. You must understand that the side with the greatest conviction is always the side that prevails. It is the side that is willing to commit to the highest level of sacrifice. There will be no dipping toes here. You cannot defeat the American people with a police action. You can slaughter ten of us with your advanced weaponry and one hundred more will be rallying behind us. We are not afraid because you must understand that you are calling us into a Holy War. That is what this is for us. We do not intend to strike the first blow but we will defend ourselves at any cost. In the end we know that we can trust no one. As much as I love to pat our Senators on the back when they do well, I will not forget that the vote was 98-0 in the Senate when they decided to take guns away from veterans without due process. You do not spit in the face of a veteran in my country and certainly not in the face of 125,000 of them without giving them a proper hearing. You encourage these men and women to fight for their country and then turn your back on them when they come back with the mental scars of war. Not all of these men and women and dangers to society and you cannot convince me that they are. I suppose it was simply most convenient to label all of them, just as you have labeled "The Patriots." We have taken note. This is the tyranny that you are vowing to lay your life down for if you are a member of this "private army." Why do you think they ordered 1.6 billion rounds of ammo? You are not stupid. Why are you shooting at targets of armed senior citizens, pregnant women and children? The company was asked to specially manufacture those for YOU. They do not carry those in stock. They are conditioning you. They are preparing you for a war which you will not win and you are pledging your life for the rule of a tyrant. I am asking you today to honor the people of this country and not the desires of a despot who wishes to be dictator. Use common sense. Why are you being trained in close quarter urban combat? We know about that. Why are they training you to drive the buses that were formerly driven by civilian contractors? We have been warned. We know about the "mass rallies." Those of us who are awake know that martial law is coming. We just don't know when. You need to understand that you will not be coming at paper targets. We will fight you with any resources we have and we will be coming from everywhere. We will follow no set rules of engagement which is what makes us dangerous. You cannot predict our movements. We will fight back with extreme prejudice and there are millions of us willing to do so. You are being prepared to go to war against the largest army in the world. This is not North Korea. There are way more than 9.5 million of us armed here. We dwarf that army. If they want to try to invade we will fight them too. We will have no problem with putting you six feet under if you come at us in violation of our constitutional rights. You are taking the form of the modern-day "redcoats." Ultimately it is your call. You are being trained and you may think it is for reasons other than the obvious. After all, Al Qaeda is rumored to be sending lots of senior citizens, pregnant ladies and children as operatives to this country. There will be millions of them which is why you certainly need this much ammo. Wake up. I know you need a job and I know you serve in that capacity admirably, but if you cannot see what is happening then shame on you. You are being mobilized as a private police force to stand against the people of this country. When the order comes down you had better remember who you are really fighting for. Are you willing to die for your king? You had better think long and hard about that question because the day is coming when you will be asked to make that decision. For the American Patriots there is no decision to be made. Our king is more than just any king. He is the King of Kings. So for now we will continue to cling to our God and our guns and we are quietly waiting for you. There is a rifle behind every blade of grass. And where I live there may be 2-3 rifles behind every small shrub. So what do you say? Want to get this party started? We will not fire first because contrary to what you believe we are not terrorists. But we will be waiting and we grow more anxious every day. We are just waiting for you to give us an excuse to take back our country. We are not ruled by fear but, rather, bound by honor. We will see this as an opportunity to regain what is ours. For all of those who have fought and died for our freedom, we will hold on to it tightly. Freedom shall not fall on our watch. No one ever made the ultimate sacrifice for this country in the name of radical communism. You have broken a sacred promise to men and women who fought and died for you. This is not acceptable and make no mistake…We are not slaves and we will not bow down to communist rule. We will not bow down to anyone if it means that the nearly 1.4 million Americans who have died in battle will have done so in vain. You also may want to remember that many of the current military and veterans will be standing with us. Do you really think you have a chance against highly trained Green Berets, Rangers and Seals? I know you are scared and I would be too. But if you decide to fight for the enemy you will be dealt with accordingly. No mercy will be shown. So what do you think DHS? Are you ready to face a standing army of 20 million? That is what you are up against. We will die for our King. Will you die for yours? Are you prepared for a SHTF scenario? It's time to start meeting people in your area. I need to make it clear that we are not a militia and we are not planning any armed offensive revolt. We offer a place where people gather to meet others in their local area, and prepare for the possibility of the worst. Over 23,000 people have joined us in 11 days. Join your local team below to start meeting other individuals who are like-minded and are vowing to stand together.